The withdrawal line of southwest monsoon continues to pass through Lat. 16°N/Long. 94°E, Lat. 15°N/long. 90°E, Machilipatnam, Kurnool, Gadag, Vengurla and Lat. 16°N/ Long. 60°. 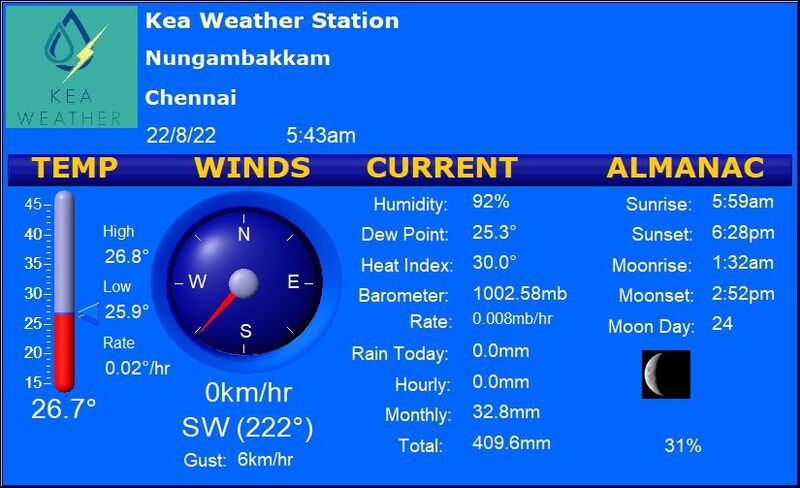 Chennai – Sunny and seasonable with a high of about 34 degrees and a low of about 27 degrees. Madurai – Some clouds with a high of about 34 degrees. Chance of isolated thunderstorms developing over the day. Trichy – Clear with a high of about 33 degrees and a low of about 25 degrees. Vellore – Seasonable day with a high of about 33 degrees and a low of about 21 degrees. Coimbatore – Partly cloudy and warm. High of about 33 degrees and a low of about 22 degrees. Chance of thunderstorms later during the day.